Above: Dolce LaVeta Detail and full quilt made up of samples I used on The Quilt Show. Left: Cubic Stars ©2004 (Pattern Available) I've been so busy the past few days trying to get all the orders from my new website out in a timely manner. The response to The Quilt Show airing has been amazing, but knowing Ricky and Alex and their popularity and marketing skills, it is not surprising. So, I've been puzzling how to make this blog interesting and useful, something that you will want to come back to from time to time. Maybe you'd like to see new things that I am working on? Or maybe you'd like for me to share tips or techniques that make your quilting life a bit easier? What would you like to know that I may have some expertise about? Either e-mail me through the link on my website, or add a comment to this blog. I'll try to do my best to make it worth your time to follow my blog. Let me know what you'd like to know more about. Some questions I've gotten recently are about how to use my ruler, so I'm in process of putting together an instruction sheet to accompany it when it is shipped. Not done with it yet, but it will be coming. 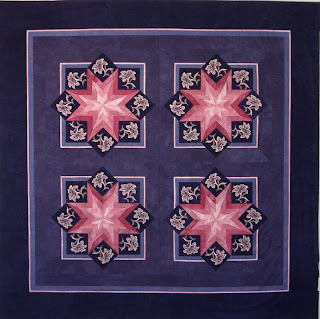 If you've already purchased one from my website or from The Quilt Show Shop, watch this blog for the information. 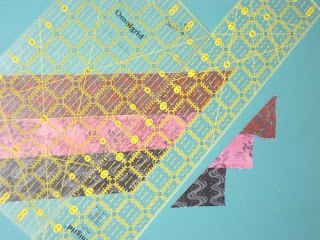 In the meantime, here are my Top Tips for Precision Piecing. This is a little information sheet that I share with my students who take any of my Star workshops: Cubic Stars; Wall Flower; Seeing Stars; etc. (I'm going to try my hand at making and downloading small video clips of some of these tips in a later blog.) Elsie’s Top Tips for Piecing: 1. Value is more important than color. If you have trouble determining value, make black and white photo copies of your fabrics to compare them. 2. Use two rulers to cut strips and squares. Square up and cut with one and measure with the other: 3. Press fabrics stacked on top of each other to ‘lock’ fibers together before cutting multiple layers. 4. Make freezer paper templates when you only need a few of one shape, or if you need a lot of different kinds of shapes. 5. Start chain piecing by stitching on a scrap of fabric before stitching onto your first piece, snip this “starter strip” off, and save it to stitch onto as you end your chain. This makes it easier to stitch straight on and off narrow points and small pieces, and leaves no thread tails on either end of your chain. 6. Use a ball point awl to un-stitch instead of a seam ripper. You won’t have little ‘hairs’ to pick out later, and there is no sharp point or blade edge to put your fabric or your hands in jeopardy. 7. A wooden skewer, stylus, awl, or stiletto is great for guiding small pieces through your sewing machine. (Saves your fingers, too.) 8. 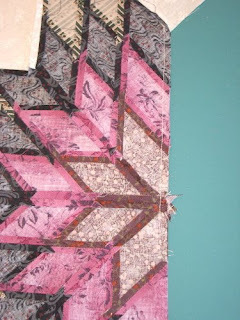 An old saying in the building industry is, “Measure twice, cut once.” This is great advice for quilters, too! 9. Use strips of freezer paper as basting tape. This is especially helpful when matching stripes, and border prints in mitered corners. 10. 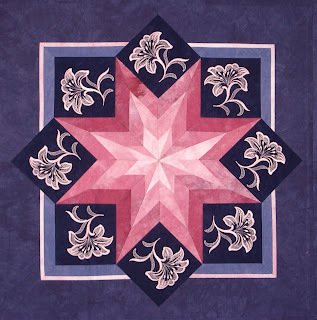 Reduce bulk where lots of seams cross, like the centers of stars, by pressing seams open. Bulk results from many layers of fabric laying on top of one another in one place. When fabric folds back on itself, even more bulk is cre ated, so releasing some of the stitches in the center seam allowance will allow the fabric to unfold to make a flatter center. 11. Finger press seams before pressing with an iron. The more often you press your piece with an iron, the more chance there is to distort fabric edges, especially if the edges are on the bias. Take care when pressing, and press as few times as possible. 12. Do not use thread darker than your lightest fabric. You can always darken light thread that shows on the surface with a Pigma or other fabric safe permanent ink pen, but you cannot lighten dark thread that shadows through light fabrics.